Journal@New Insights provides your clients with their very own web-based, password-protected journal. When you add the journaling component to your client's experience, you create a whole new dimension of sharing and communication. This additional level of sharing and communication will provide access to a whole new realm of information, dramatically deepen your relationships, drive repeat and referral sales and increase client retention. Journal@New Insights is an intelligent information delivery system. Now you can create and deliver guided journaling assignments, e-courses, training and/or daily tips - automatically. All you have to do is develop and organize your content, add it to the system, and you're done. Journal@New Insights will deliver your content automatically to your chosen clients on the schedule you set up, without you lifting a finger. It's that simple. The system supports all media types including audio, video, PDF documents, and much more. Journal@New Insights helps you build a community, not just a database. The difference between a community and a database is engagement. When members interact, they're emotionally engaged which translates into high site retention - people come back to the site on their own and often. This is important leverage. It also means you have a captive audience that is primed and ready to receive (or buy) what you have to offer. Upgrades to Journal@New Insights with new features and functions are regularly developed and delivered by the JournalEngineTM team. Their first rate, full time customer service team solves any and all technical issues usually within 24 hours or less. There are video tutorials for every feature and function of Journal@New Insights, so you'll have no problem understanding how to add new client members, change profile details, adapt security levels, build your own e-courses and so on. 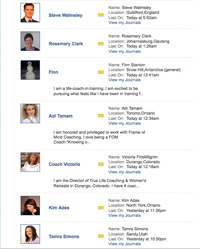 *Certified Coaches who choose to subscribe to both Journal@New Insights AND the Life Coach Directory will enjoy a R100 discount meaning total fees for both will be R400p.m. Please download and print the Licensing Agreement and Bank Debit Mandate. On page 1, please insert your name and address (or that of your practice if that is the legal entity that is contracting with). Add your signature, printed name, title and date on Page 4 under 'For Licensee'. Complete the Bank Debit order Instruction on Page 5. Remember to delete where not applicable in (A) and insert starting month in (B). Initial all pages in the bottom right hand corner and in the right hand margin where you have made deletions or amendments. Fax the completed form back to NIA on 086 648 9988 or scan and email to the address you have on file (not listed here to prevent spam attacks). (PDF format is preferred but not essential).